These tools are very costly in terms of personal uses. But if you want to keep your information for future need, you will be spending money to purchase this equipment. Move Your Business To Cloud Platform In Free With Security. Cloud Computing will save you money and time. Reduce the expenses of your organization and save data at a low cost. Cloud computing is a virtual shared server and provides hosting to users. This computing system only charges those places, which has reacquired by you to save your data. The number of companies provides support for infrastructure, software, and platform to his users. The access of this system does not require prior knowledge to handle the software or platform. In past, it is very difficult for companies to save data, they were prepared to establish data center, run software on daily basis, pay money for the update. Now Cloud Computing is the platform to provide all services at a low cost. Third party administrator provides space as per your need and charges money accordingly. Users will not be arranged separate device for data storage. 1. Hybrid Cloud - Combination of two clouds like - Public, Private, Community. 2. Private Cloud - Use by the specific organization with the prescribed limit. 3. Public Cloud - Use by any Internet users. 4. Community Cloud -Use by two or more organization. 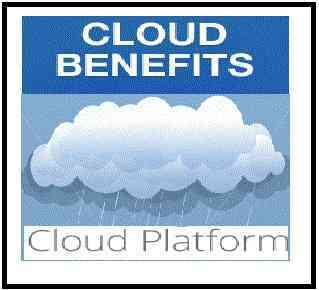 The number of benefits is available to use Cloud Computing. 1. Reduce your cost of expenditure and save money. 2. Save your office space to the establishment of equipment. 3. You can use and track your data from anywhere. No dependency on location. 4. Full concentration on your business to compete in the market. 5. A well advance knowledge IT team manage your data safety. 6. You will not be purchased additional equipment for the update. Google cloud platform is unique and beneficial for users. You can move your business on the Google Cloud Platform. They are giving Future Proof Infrastructure, Powerful data analytics, Server-less fully managed to compute, Customer Friendly Pricing, Innovation, and Security. They are providing Free Trail for users satisfaction. Contact Sales for the free trial. Cloud computing is a great tool to help the government and e-governance. Online availability helps to uplift your business faster.